Solar energy is about to get a lot more attractive for commercial property owners in Massachusetts. Under the state’s new solar energy incentive program (known by its acronym SMART) building owners will now have the option to build “stand alone” solar energy projects on their roofs. To better understand this new option it’s important to also understand how traditional “behind the meter” (BTM) systems work. A “behind the meter” system means that the solar energy system is paired with the energy load of that building, supplying the building tenant directly with power. A BTM solar system allows an owner to use the energy generated by their solar system first, before having to use energy supplied from the grid, directly reducing the amount of energy purchased. As energy rates continue to rise over time, as they traditionally have, the owner’s energy savings from avoided electricity costs increases. This model is ideal for owner occupied buildings that use lots of energy, but is more challenging for tenant occupied buildings since it requires the building owner to enter into individual power purchase agreements with each tenant/additional meter. A stand alone system sits “in front” of the meter and feeds power directly into the grid, as opposed to using it on-site. In the newly proposed SMART program, owners of stand alone systems will be allowed to sell 100% of the energy generated directly to the utility at a fixed price for 20 years. The solar energy system is no longer tied to the load of the building and this allows the property owner to turn their roof into an additional revenue generating asset - regardless of whether the building is occupied or not. The long-term nature of the incentive makes it easier to finance the system and the owner can benefit from federal tax incentives such as the 30% Investment Tax Credit and accelerated depreciation. In locations where Property Assessed Clean Energy (PACE) financing is approved, building owners may be able to take advantage of low-interest PACE loans where clean energy projects are financed at low rates and then paid back via property tax bills, typically over the useful life of the asset. The chart above shows the different revenue streams for each kind of project. There are many factors that will ultimately drive the decision for the best way to site an energy solar system. Speaking with an experienced commercial solar provider will help you to determine which model will be the better investment based on your unique circumstances and financial goals. 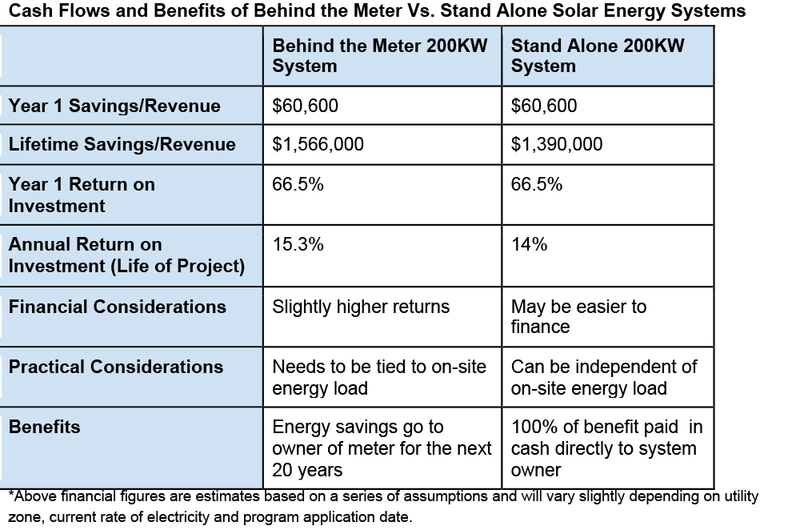 Regardless of whether you move forward with a stand-alone or behind the meter system, each option offers property owners the ability to directly participate in the benefits of going solar, while also adding a long-term asset to their building. 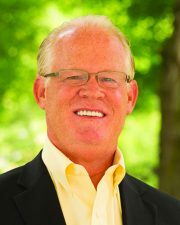 Craig Huntley is founder and chief development officer at Solect Energy, Hopkinton, Mass.